The world isn’t literally getting smaller, but you’d be forgiven for feeling that way. Customers around the world expect a consistent, on-brand experience on any device and in any country or language, and brands must face the challenge of delivering on that expectation. 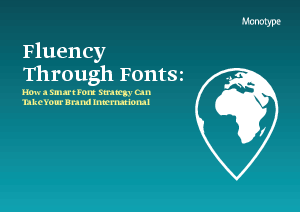 Monotype’s latest eBook, Fluency Through Fonts, shows how a smart font strategy can help break down language barriers and lead to a smoother, more effective workflow for brands with a global audience.